The 2016 Land Rover Discovery Sport has an ace up its sleeve against the BMW X3 and Audi Q5 it targets. Sure, it's an elegant and comfortable luxury SUV, one coming from a manufacturer with as storied a pedigree as you'd care to mention. So what's the special trick? It has off-road abilities that the others just can't touch. 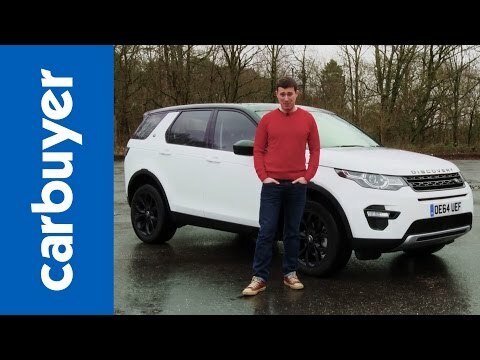 Land rover discovery sport: fun classy compact SUV. I am very pleased with my discovery sport. It provides a very smooth quiet ride. I am a bit zippy on take off and she absolutely complies. I love the look and design of this SUV. It is rugged, yet classy. This vehicle is a head turner. I actually test drove about 6 different mid size SUVs before settling on my discovery. The sound quality of the stereo system is top notch. I do recommend a CD player if you are not interested in satellite radio, however. The GPS package is spot on. I detest using my phone when driving. I know many people do but I refuse. I love that I may answer my phone through my steering wheel! I am almost 50 so this technology just tickles me pink. My husband linked my phone to the car and it works great. The only problem I have actually had is a bit of a lark. I took her through a car wash and one of the roof rack pieces flew off. Needless to say I was not pleased. However, I brought it back to the dealership and they replaced it under my warranty. No charge. Also, I have found that my dashboard video display sometimes gets stuck when it is cold weather or a glare from the sun hits it just right. I have had my SUV for almost 2 years and those are my only two complaints. As far as size goes it is rather small if you need car seats. My little one is 4 and when he is in his car seat whoever is in the passenger seat has to pull the seat all the way up or he cannot stretch out his legs. My oldest is 21 and 6 ft tall. He cannot sit comfortably in the backseat because of his height and very little leg room. I would say if this is the only vehicle in your household, it is fine for every day outings but wouldn't recommend it for an extended drive for a vacation destination. Bottom line is I absolutely love it but my husband prefers his truck for legroom, height and long drives. My solution is buy the next size up if it is your only vehicle unless your husband is short or does not mind being a little squished. Discovery sport - no problems. The discovery sport is an amazing car that I have yet to have any problems with and it has given me lots of comfort throughout the year or so. We had bought leather seats and not too many upgrades to the car, although it has been well. It was very reliable and has performed well. Once I had a flat tire on the highway and I had called for a mechanic through the car, and it had worked well, although we did have to wait an hour to receive help. No issues whatsoever, and out car did contain a spare tire. Small SUV with a big attitude. This is a great SUV. It is the perfect size for a small family and to fit in small parking spots. It is incredibly reliable, very comfortable. Mine does have the 3rd row, which is small but big enough for small children. However, the trunk space is limited and with the 3rd row up no space. Seat warmers are a must and I love the steering wheel warmer. The navigation is easy to use and so are the vehicle settings. I would recommend this vehicle to anyone wanting a smaller SUV.